October 2008: Total German Shepherd Newsletter - Want to learn more about the German Shepherd Dog? Here is the best German Shepherd Dog information available on the web, and all in one place, just for you and your German Shepherd. Read on to learn more . . .
Just a quick heads up that we've added several new pages and articles all about the German Shepherd that you just might be interested in reading since our last newsletter was published. Introducing your dog and your baby is an important step in making sure that your family all gets along well. . . . . Here's a new video I've just added all about hot spots in the German Shepherd. . . . . Does your dog eat grass? One of my dogs eats grass like a cow. . . . . Teaching your dog to wait is a very important command for your dog to master. It may even be lifesaving. . . . . .
You may not be aware of it, but there are several German Shepherd coat patterns available in the breed . . . . If you have an important question about your dog it's almost always late at night, after regular doctors hours, or on the weekend when you just can't get an answer otherwise. So, now what do you do? Don't worry! Here's one helpful alternative in case you get in just that predicament. If you have any sort of dog related health questions please feel free to get advice directly from a real dog expert - right now. Best of all, it's very affordable! Help support our site - if you are in the market for German Shepherd related items or gifts please see what we have to offer. We have a wide range of products from the finest of dog collectibles to things you use everyday, like regular checks, and everything in between. Thanks for browsing. This German Shepherd purse is crafted of the highest quality materials, featuring a large image of the German Shepherd accented by real leather trim and handles. Handsome metal rings and feet add fashion flair and durability while the zipper top and front pocket open to lined compartments that hold all your belongings. Any of these items would be wonderful gifts for any German Shepherd lover or owner. Here you can select from puzzles, frames, tote bags, doormats, throws and much more. 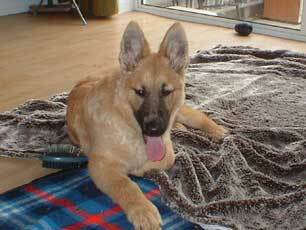 We have added new and exciting ebay German Shepherd auction items to our site. Now you can browse through the menu of items presented here to find the perfect GSD product you are looking for - then, just click on the item to bid right away! This store is continuously changing so visit often. Not an ebay member? No problem, you can join here for free as well. Have fun browsing and shopping among all these GSD collectibles and dog related items: plates, clocks, figurines, toys, fine jewelry and much more. The GSD Collectibles on this page may change from time to time so feel free to browse all you like - if you see something you like, order quickly since many of these items are seasonal only and only offered for a limited time. Order your own personal German Shepherd checks designed exclusively by dog artist, Linda Picken. These four German Shepherd dog check portraits are so true-to-life, you'll want to give each one a belly rub! Do you need a gift for the German Shepherd lover in your life? German Shepherd Dog calendars are always a cherished and desired year-long gift. These German Shepherd watches are among the nicest I've seen around - in fact I own a GSD watch myself and love it. Need another dog breed on a watch. That's possible too. There are many breeds to choose from. Looking for a beautiful German Shepherd Dog wallet? Then you're definitely in luck. These great GSD wallets make wonderful gifts too for the dog enthusiast in your life. Outstanding Savings on Dog Treats. Outstanding Savings on Dog Treats. Total GSD is looking for more pictures of your beautiful German Shepherds to include on our website. We're looking for clear and colorful, non-copyrighted personal photos of your German Shepherds only, in various settings: while at play, work or wherever. The best photos showing the most character will be chosen. For more info, contact us at our contact form on our website at any time, or you can send them to us directly at: "gsdphotos (AT) rock (DOT) com" .